HF: The manufacturing of rubber products was one of Hong Kong’s six leading industries in the late 1950s. And part of that industry was the production of rubber footware. Even in the early 1950s there were over 60 factories producing such items employing over 8,000 people. This initial article brings together a few items we have gathered about the industry in chronological order where known. Many thanks to IDJ for supplying a couple of the images. Undated publicity from I think Fung Keong Rubber which is written on the tyre. 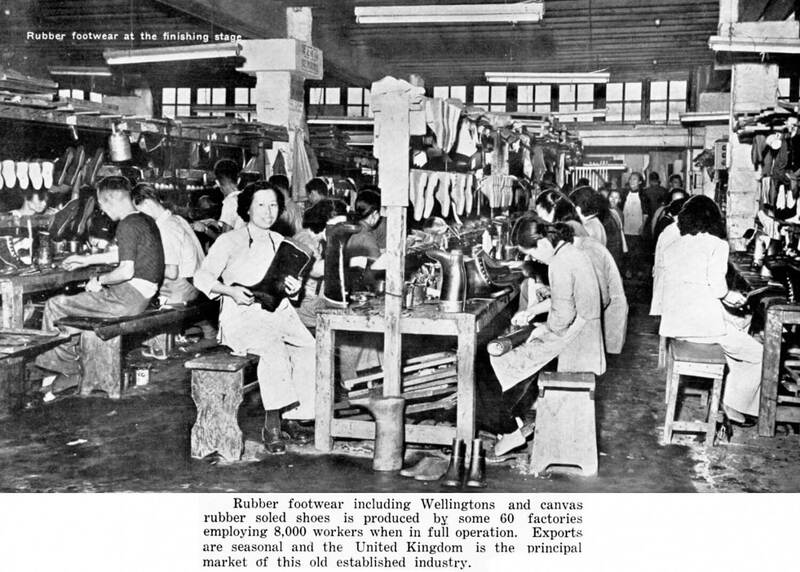 1939 Here is a list of registered Rubber Shoes factories and workshops in Hong Kong. This report from 1948-1949 about the Fung Keong Rubber Company says its location was at 407 Shau Ki Wan Road. 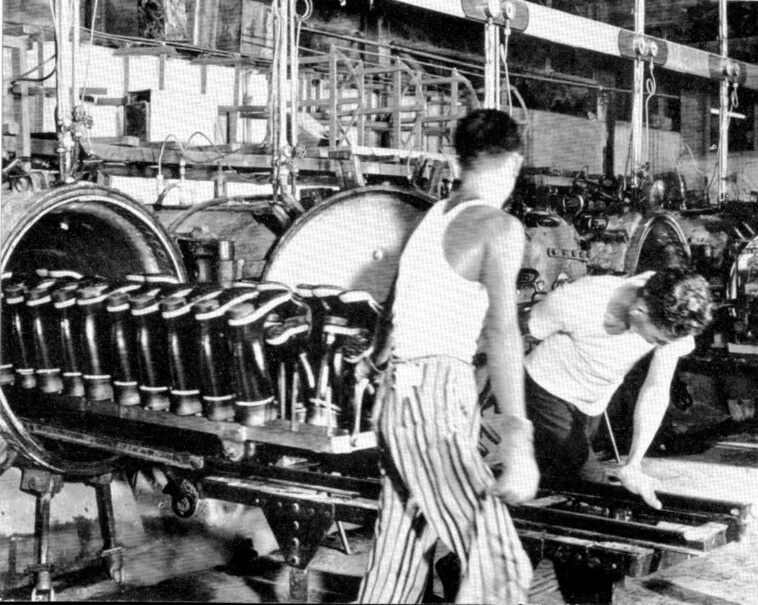 1952 The industry had greatly expanded by the 1952 the date of this photograph as the caption states. Date/Location unknown.Wellington boots being cured in an oven. See: The historical development of [the] rubber footware industry in Hong Kong, Lai-ting Luc/Luke, pub?, 1957. Out of print. Can anyone provide further information about this publication? Excellent information about Hong Kong’s rubber footwear industry. I remember seeing plimsolls and wellingtons exported from Hong Kong for sale during the 1950s and 1960s in British stores such as Woolworths and Timpsons. The wellingtons were matt black with contrasting grey top bands and foxing, just like in the photographs. On the front they had colourful rubber labels embossed with the words “Empire Made” and the name of the importer, e.g. “Dodca” and “Rosped”. 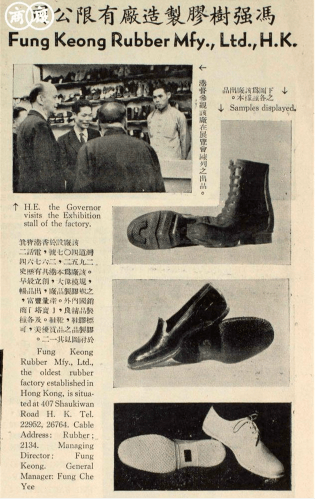 For further information about the import of Hong Kong rubber footwear to the United Kingdom, I recommend reading the thirteenth chapter, “The Hong Kong Importers”, of the Competition Comission report “Report on the Supply of Certain Rubber Footwear.” at http://webarchive.nationalarchives.gov.uk/20111202181215/http://www.competition-commission.org.uk/rep_pub/reports/1950_1959/015footware.htm. Luke, Lai-ting. (1957). 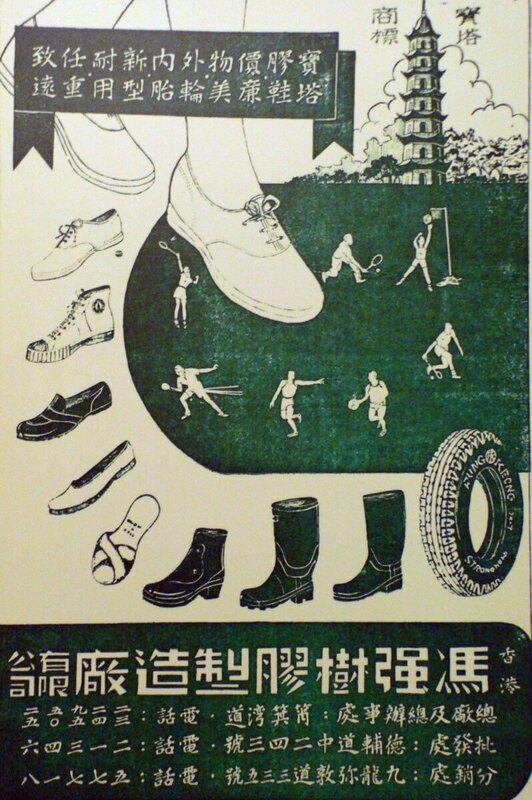 The Historical Development of Rubber Footwear Industry in Hong Kong. Unpublished Thesis. Hong Kong: The University of Hong Kong.